Acquisition Control Peripherals: Jaguar Hardware Enclosure housing an extremely powerful RISC processo r to perform real-time calculations and control TPD operation. ACP may house as few as one measurement card or as many as 10. Communicates with Host Via 100 Base T Ethernet. Measurement Channels: Each channel pair shares a 32 bit DSP. The DSP is automatically loaded with code based upon application. Each channel includes 4 overlapping Programmable Gain amplifiers to permit extraordinary measurement accuracy for each unique application. Each channel may be calibrated, permitting channel transportability. User may select One to 30 DAC Systems. 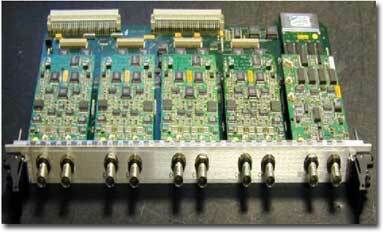 Digital to Analog Systems: Each DAC system includes a 16 bit converter sampled at 204.8KS/sec. All DAC systems include smoothing and anti-imaging filters to insure true analog quality signal generation free of harmonic content and distortion. Sine step increment is .00001 Hz. Expansion – Monitors & Channels: Start with 8 chs. Grow to 588, all simultaneously captured and displayed with virtually no phase shift. Add additional monitors to provide instant simultaneous access to hundreds of real-time data displays. Speed: All JAGUARs are capable of sampling all measurement channels at 102.4KS.sec. All channels are always simultaneous. Each data array produced always starts at the same exact data point. This is critical in time series analysis. SIGMA/DELTA converters do not intrinsically perform this way. Accuracy: Summing junctions are designed into the signal path that permit calibration constants to be employed for each of 18 input ranges. The software may then properly set zero DC levels dynamically while a test is running in Sine or Random applications so the channels may auto-range to ensure optimum use of the dynamic range for measurement accuracy. JAGUAR is the only system in the world capable of changing the input ranges during a sine test with no adverse affects to the data. Throughput Disk: May be included inside the ACP and/or external to the ACP. As many as 6ea. 70Gbyte drives are permitted per ACP. Time histories are streamed through the MDSP3 Risc processor, resident in each ACP, in parallel to the stream of data to the host. Storage is continuous and contiguous even across disk boundaries. Gap free operation assures data have no discontinuities. Time Stream Data: The application software determines sample rate of TPD data. Maximum rate is 102.4KS/sec.Sample to TPD may be started and stopped at user discretion. This feature is driven by the individual applications. Data stored to TPD is always gap free. Design Responsibility: All measurement and signal generation hardware is designed and manufactured by Spectral Dynamics in San Jose CA. Six pole analog filters precede each digital filter with set cutoff at 225KHz. Optional H/W: Remote Communications Interface to connect your JAGUAR to your chamber controllers, Sampling Synchronization Card to connect ACPs together on a single host, Over-Test Protection Unit for additional test article safety.